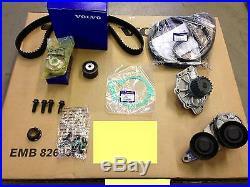 GENUINE VOLVO TIMING BELT CHANGE - COMPLETE KIT. TO FIT - V70 mk2 MODEL YEARS 2006 - 2008 APPROX. S60 mk1 MODEL YEARS 2006 - 2009 APPROX. S80 mk1 MODEL YEARS 2006 APPROX. XC90 MODEL YEARS 2006 ONWARDS APPROX. SUITABLE FOR D5 DIESEL ENGINE ONLY. KIT INCLUDES - TIMING BELT, TENSIONER & IDLER. AUXILIARY BELT, COMBINED TENSIONER & IDLER. WATER PUMP, GASKET & BOLTS. CRANK PULLEY NUT & BOLTS. The item "GENUINE VOLVO D5 TIMING BELT WATER PUMP AUX COMPLETE KIT V70 S60 S80 XC90 2006" is in sale since Friday, June 14, 2013. This item is in the category "Vehicle Parts & Accessories\Car Parts\Service Kits". The seller is "caffyns-volvo" and is located in Eastbourne, East Sussex. This item can be shipped worldwide.